Have you ever heard of Chicken Riggies? Chicken Riggies is a casserole recipe popular in the Utica, New York area. 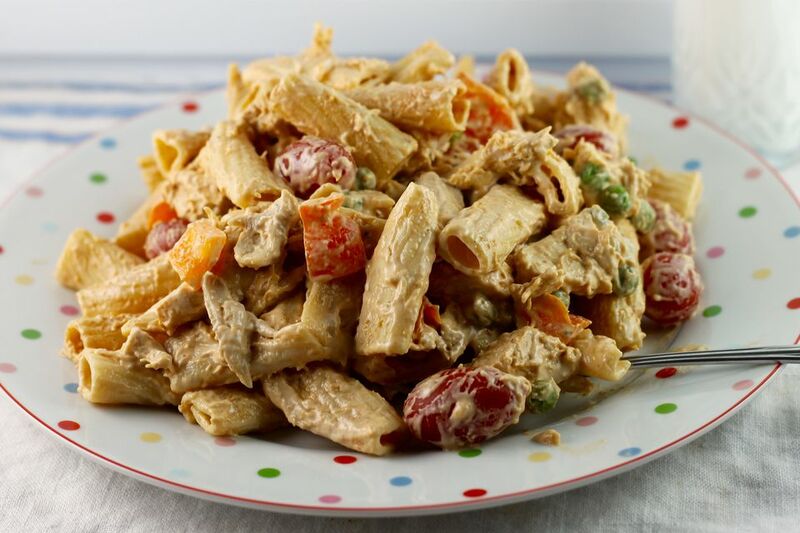 The recipe is made with cooked chicken and rigatoni pasta combined in a spicy and creamy sauce. I love the idea of this recipe, and decided to turn it into a main dish salad. To get the spicy flavor and the pink color of this casserole into a salad, I turned to mayonnaise and two unusual ingredients: barbecue sauce for flavor and color, and cream cheese for texture. The casserole recipe usually uses tomato sauce, paprika, and red pepper flakes to get that spicy flavor and color. This salad is packed with flavor, color, and texture. You could certainly add your own favorite vegetables and cheeses to the salad. Some sliced zucchini or yellow summer squash would be a great addition, as would diced tomatoes, minced green chilies for more sick, or sliced green beans. Remember that you can vary the spiciness of the recipe. If you like hot foods, add more red pepper flakes or add some smoked paprika. If you like it mild, choose a mild barbecue sauce and reduce the pepper. Enjoy this recipe on the porch with a glass of iced tea, or tuck it into your insulated lunch box to take to work. Bring a large pot of water to a boil. Add a tablespoon of salt, then add the pasta. Cook the pasta, stirring occasionally, until al dente according to package directions. This should take 10 to 13 minutes. Meanwhile, combine the cubed cream cheese and milk in a large microwave-safe bowl. Microwave on high for 1 minute; remove and stir. Continue microwaving for 1 minute intervals, stirring with a wire whisk after each interval, until the cream cheese is melted and the mixture is thickened and smooth. Stir the mayonnaise, barbecue sauce, lemon juice, red pepper flakes, and Parmesan cheese into the cream cheese mixture. Drain the pasta when it is cooked and add to the dressing along with the chicken, bell peppers, tomatoes, corn or peas, and green onion. Stir gently but thoroughly to coat. Cover and salad and chill it for a few hours to blend flavors before you serve it. After the salad has been in the fridge overnight, you may need to add more milk or lemon juice to bring it back to a creamy consistency.